This article is about the U.S. automaker. For the British rail-locomotive company, see Brush Traction. 1912 Brush Runabout, owned by a resident of Saskatoon, in a local museum. Side view of museum model. 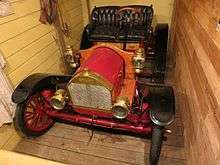 1909 Brush automobile, currently located at the Linn County Historical Museum in Brownsville, Oregon. Brush Motor Car Company (1907-1909), later the Brush Runabout Company (1909-1913), was based in Highland Park, Michigan. The company was founded by Alanson Partridge Brush (February 10, 1878 in Michigan – March 6, 1952 in Michigan), who designed a light car with a wooden chassis (actually, wooden rails and iron cross-members), friction drive transmission and "underslung" coil springs in tension instead of compression on both sides of each axle. Although there were many makes of small runabouts of similar size and one to four cylinders at this time (before the Model T Ford dominated the low-price market), the Brush has many unusual design details showing the inventiveness of its creator. Power was provided by a large single-cylinder water-cooled engine. Two gas-powered headlamps provided light, along with a gas-powered light in the rear. The frame, axles, and wheels were made of oak, hickory or maple, and were either left plain or painted to match the trim. The horn was located next to the engine cover, with a metal tube running to a squeeze bulb affixed near the driver. A small storage area was provided in the rear, with a drawer accessible under the rear of the seat. A feature of engines designed by Brush (who also designed the first Oakland Motor Car, ancestor of Pontiac and who helped design the original one-cylinder Cadillac engine) was that they ran counter-clockwise instead of the usual clockwise, which, in those days before the invention of the electric starter, was Brush's idea intended to make them safer for a right-handed person to crank-start by hand. With clockwise-running engines, many injuries were sustained, most often dislocated thumbs and broken forearms, if the hand crank kicked back on starting, especially if the car was not properly adjusted before starting, or the person cranking it did not follow correct safety procedures, including fully retarding the manual spark advance, keeping the thumb alongside the fingers instead of around the crank, and pulling the crank upward in a half turn, never in a full circle or pushing down. In 1912, Sid Ferguson drove a Brush Runabout with Birtles as navigator, becoming the first persons to drive across the Australian continent from west to east. 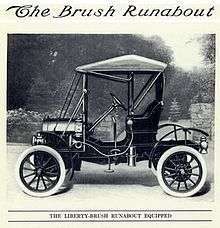 The Brush Runabout Company, along with Maxwell-Briscoe, Stoddard-Dayton, and others formed Benjamin Briscoe's United States Motor Company from 1910, ending when that company failed in 1913. Runabouts, in general, fell out of vogue quickly, partly due to the lack of protection from the weather. 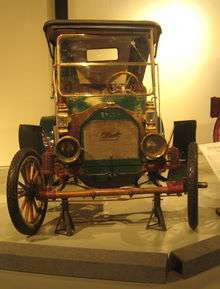 A restored 1909 Brush Runabout is on display at the Linn County Historical Museum in Brownsville, Oregon, with another under restoration at Old Rhinebeck Aerodrome for the New York State aviation museum's automotive collection. Liberty Brush Automobile on Smithsonian site The Liberty Brush was distinguished from the standard model by a different treatment of fenders which were not attached to the separate side step. The standard model had long sweeping front and rear fenders connected to a very short running board. Wikimedia Commons has media related to Brush vehicles.